How do I get rid of a friend from MySpace? There doesn't seem to be any way to delete them. There are so many things that should be easier on the MySpace site, I don't even know where to start with the complaints. Fortunately, once you know where to look, deleting a friend from MySpace is relatively easy. 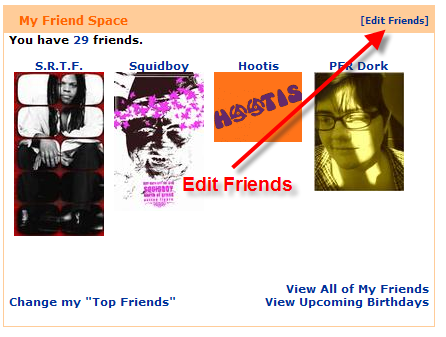 On the Edit Friends page, check the box next to the friend you want to remove and then click the Delete Selected button. Editorial Note: If Bre is your friend, don't delete him. He rocks! There is no confirmation for delete friends. As soon as you hit that button, the friend is gone.